Hebe barkeri was found in 1898 by S D Barker on Chatham Island, New Zealand. The branches are erect, pale green to brownish-purple. 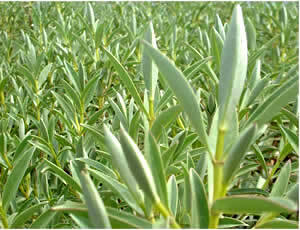 The pale green, evergreen leaves, are spear-shaped, about 2 in (50 mm) long and 0.5 in (12 mm) wide. The flowers are purplish-blue, fading to white, late June to July or August. Fairly hardy in the UK. Hebe barkeri is somewhat similar to Hebe chathamica and Hebe dieffenbachii, also from the Chatham Islands, New Zealand. Hebe barkeri is classified as vulnerable.